Over the winter months I had thought a lot about shoe selection for the 2012 season. I had used the innov8 road shoe throughout 2011. I loved the feeling of the shoe and had been using innov8 talons off road for years. However, looking back on my Ironman races I was getting extreme pain on the balls of my feet due to the pounding they received out on the tarmac. In addition, my right ankle was badly swollen after each race. I guessed that this was being caused by my foot collapsing inwards as I fatigued and my form fell apart toward the end of the marathon. As a result, I started looking at alternative racing shoes for the 2012 season. What I was looking for, was a racing shoe that was super light, but offered me a bit more cushioning for the balls of my feet, combined with a very slight amount of medial support to help prevent my right ankle from collapsing in the later stages on the run. I was also guessing that the reduced impact in a cushioned shoe might also reduce the fatigue in the muscles. Having done a bit of research into this it seems I am not the only one who believes this to be true. While shopping with Carli in London I found myself in Nike Town. I was not expecting for one second to find a race shoe, but was very interested to try out the Nike shoes on the treadmill. 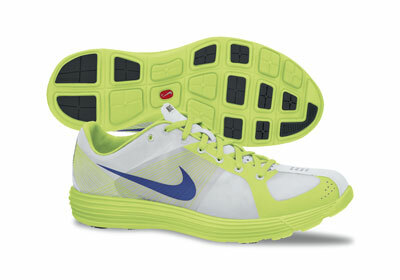 The second pair I tested was the Nike Lunar racer. I was totally blown away. This shoe was everything I had been looking for. The balance between a light weight, minimalistic shoe with a very slight amount of support and cushioning – happy days. I bought a pair on the spot. Since then the shoe has lived up to my expectations. However, there is one serious problem. They give me the mother of all blisters on my heals when I run in them at a tempo pace for an hour or more. I have NEVER had a problem with blisters before, but these blisters are so bad it has become a serious problem. I love the shoe and was kind of hoping my feet would adjust. However, this does not seem to be the case. If I am to race in them in the longer distance events this year I need to find a way of avoiding these mega blisters. 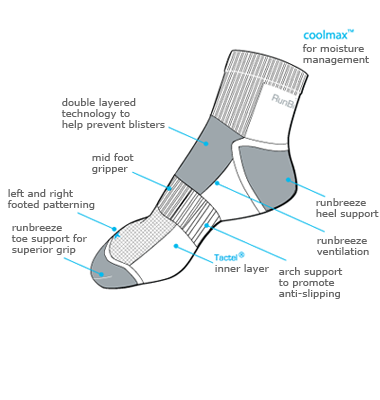 One possible solution that was presented to me by a friend was the RunBreeze anti blister sock. My first impression of the socks were that they seemed quite heavy duty. I was a little concerned about my feet overheating using what I considered to be quite a thick sock. The first run I did with the socks was a tempo 30min run at 3min50secs / km pace. Normally, when I use a new pair of socks they kind of need to be ‘broken in’ and the first run feels a little uncomfortable. I guess that is the best way I can describe it. With the RunBreeze anti blister socks on their first outing they felt surprisingly good. My shoes had a very slightly softer feel to them and the socks did not feel too warm, given the thickness of the material. In regular socks after 30mins at a tempo pace I would start to notice the rubbing on my heals but nothing to major. With the run breeze anti blister sock I don’t think I could feel any rubbing at all. This is very difficult to be sure of, when you are running at a tempo pace. The only way to be certain of how the socks perform – do a tempo run for over an hour. However, at the time of doing the 30mins test run I had only 10 days until the OUTLAW. Given the close proximity to the OUTLAW this was not an option. The initial testing of the socks suggested the socks might help with my blister issue. But I had no way of knowing for sure. Sometimes you just have to take a leap of faith and that is precisely what I decided to do. 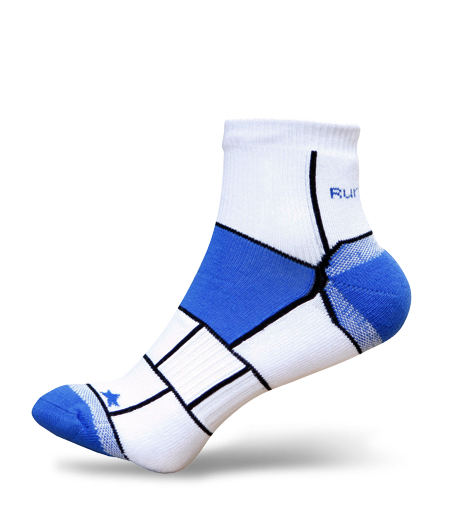 So only having used the RunBreeze anti blister sock for 3 x 30min runs I made the call to wear them for the marathon in the OUTLAW…….. I have to say it was a bit of a gamble using these socks on the weekend. I had not really tested them out properly but I am glad I took the risk. When I took my shoes and socks off after the race I could hardly believe my eyes when I looked down at my feet to see no blisters. The RunBreeze anti blister sock just became a must have bit of kit for me!!!! Interestingly, I did not have the issue of a swollen right ankle that I had experiences in previous races. So I guess my assessment of the cause (collapsing inwards as I fatigued) and the solution (a very slight amount of medial support to help prevent my right ankle from collapsing in the later stages on the run) was spot on.